Reuters reported yesterday that EU officials have come to the conclusion that Greece will need more debt "restructuring", a euphemism for debt default. Is this surprising to anyone? The Apple miss last night might cause more angst today than Greece and Spain. Apple reported net income of $9.32 per share, well below the consensus estimate of $10.35. Bloomberg Reuters The company also issued downside guidance for the current quarter, estimating diluted earnings per share of "about $7.65". Press release The fiscal 4th quarter consensus estimate was for $10.22. Maybe it is time to be more than a little bit worried. Off hand, I do not recall John Sununu making an accurate statement. I am confident that he must have done so at some point in his life. Perhaps, his name is John Sununu and he is telling the truth about that claim. Sununu is just one of those politicians who finds it far easier to create their own reality rather than to discover it through learning. The reality that Sununu creates is one that confirms or advances his ideology, a standard personality quirt for True Believers. It is hard to be factual when "the cause" is far more important than accuracy. Sununu recently said that he wished Obama "would learn how to be an American" StarTribune.com To be a real Amerian, we must learn to be like Rush Limbaugh or Sarah Palin. Afinitor, a cancer drug from Novartis, received FDA approval. Bloomberg The drug traces its origin to bacteria found in Easter Island's soil, the place of the strange and inexplicable stone monoliths. RB wants to travel to the Easter Islands and eat some of the dirt. Two new preferred stock ETFs have been launched. One new one is an offering from Global X Funds. This fund will own global preferred shares. The symbol is SPFF. The other is an offering from Market Vectors that includes preferred stocks excluding financials. PFXF (gross expense ratio .52% with .12% waived through 9/1/13) Both of these ETFs are discussed in a recent Morningstar article. The largest preferred stock fund is the offering from iShares, with over $9 billion in assets. iShares S&P U.S. Preferred Stock Index Fund (PFF) (expense ratio .48%, 282 holdings) I do not own that one directly. PFF does have close to a 15% weighting in a fund of funds that I do own, iShares Morningstar Multi-Asset Income Index Fund (IYLD). A discussion of preferred stock closed end funds can be found at Morningstar. Most articles written about preferred stock funds fail to distinguish equity preferred stocks from trust preferred securities. This indicates to me a lack of understanding about the topic. One downside to the preferred stock funds is that many trust preferred securities are being redeemed by large banking institutions due to financial reform which phases out their use as Tier 1 equity capital starting on 1/1/13. Banks with less than $15 billion in assets as of 12/31/09 can continue to count those securities as part of Tier 1 capital. Other financial journalists also do not apparently recognize, or do not mention that these funds contain exchange traded senior bonds and European hybrids (IND, INZ, AEV, IGK, AEF, etc.) which are in effect junior bonds (though most pay qualified dividends under U.S. tax laws). By way of example, the preferred "stock" CEFs will generally contain several of the following senior exchange traded bonds (the electric utilities bonds which are referenced below are First Mortgage Bonds). The links provided below are to a SEC filed prospectus. The foregoing is not meant to be a compressive list. The selection will vary among the funds. I would emphasize the long maturities of most of those notes. I own none of them individually. I have owned in the past OSM, ARY and CWHN. UPS cut its 2012 earnings estimate to $4.5 to $4.7 per share, down from April's guidance of $4.75 to $5. I thought that was significant and consistent with other data indicating a worldwide economic slowdown. 1. SOLD 100 BAM A:CA at 34.06 CADs Last Friday (see Disclaimer): I did not realize much of a profit on those shares. This brings my Canadian Dollar stash to over 6 thousand. XTR was ex dividend yesterday for its monthly distribution. Another possibility would be to add to my existing 500 share position in iShares 1-5 Year Laddered Canadian Government Bond ETF or the 300 share position in iShares 1-5 Year Laddered Canadian Corporate Bond ETF. So I am moving this sector strategy to more defensive investments. For all three of the foregoing referenced Canadian ETFs, dividends are paid monthly to me in Canadian dollars after the 15% withholding tax deduction. Brookfield Asset Management Inc. Cl A, BAM.A (TOR) closed at 33.17 CADs yesterday. 2. General Electric (own over 500 shares): General Electric reported second quarter earnings of 38 cents per share, excluding items, on a 2.5% increase in revenues to $36.6 billion. The consensus was for 37 cents on $36.8 billion in revenues. Earnings were adversely impacted by currency exchange. The industrial segment reported revenues of $25 billion, up 9%, with 10% organic growth. Cash generated from operations was $6.8 billion. GE Capital paid a $3 billion dividend to GE during the quarter. After that payment, GE Capital's Tier 1 common equity ratio was 10.1%. The company said that it was confident in its previous projection of double digit 2012 E.P.S. growth. GE raised its operating cash expectations to $17-$19 billion based on the resumption of GE Capital's dividend. General Electric fell 12 cents in trading yesterday to close at $19.98. The quarterly dividend is paid today, and I am continuing to reinvest it. 3. FNB (own: Regional Bank Basket Strategy): F.N.B. Corporation reported second quarter net income of $29.1 million or 21 cents per share, up from $22.4 million or 18 cents per share in the year ago quarter. As of 6/30/12, the net interest margin was 3.8%; the efficiency ratio was 57.74%; NPLs to total loans stood at 1.22%; the coverage ratio was at 104.89%; and the return on average assets for the quarter was 1% and 1.12% on average tangible assets. After buying and selling shares, I am left with my lowest cost shares purchased at $7.8. Added 50 FNB at $7.8 That is a typical trading pattern. F.N.B. closed at $10.85 yesterday. At that price, the dividend yield is about 4.42% according to Marketwatch. I have never reinvested the dividend. 4. WASH (own: Regional Bank Basket Strategy): Washington Trust reported second quarter net income of $8.7 million or 53 cents per share, up from 46 cents earned in the year ago quarter. The consensus estimate was for 51 cents per share. I have examined the historic dividend rates since 1986, available at The Washington Trust Company - Dividends/Stock Splits. There have been no dividend reductions since 1991, when the quarterly rate was slashed from $.0652 to $.0395. That was during a recession and a banking crisis. The bank started to raise the dividend again in 1993 and has continued to raise it every year with the exception of 2010 and 2011, when the quarterly rate was kept at 21 cents. In 1993, the annual rate was at 15.8 cents per share and had grown to 84 cents per share in 2010. Washington Trust Bancorp closed at $24.47 in trading yesterday. 5. FIBK (own: Regional Bank Basket Strategy): First Interstate BancSystem reported second quarter net income of $12.2 million or 28 cents per share, up from $9 million or 21 cents in the year ago quarter. The consensus estimate was for 28 cents per share. 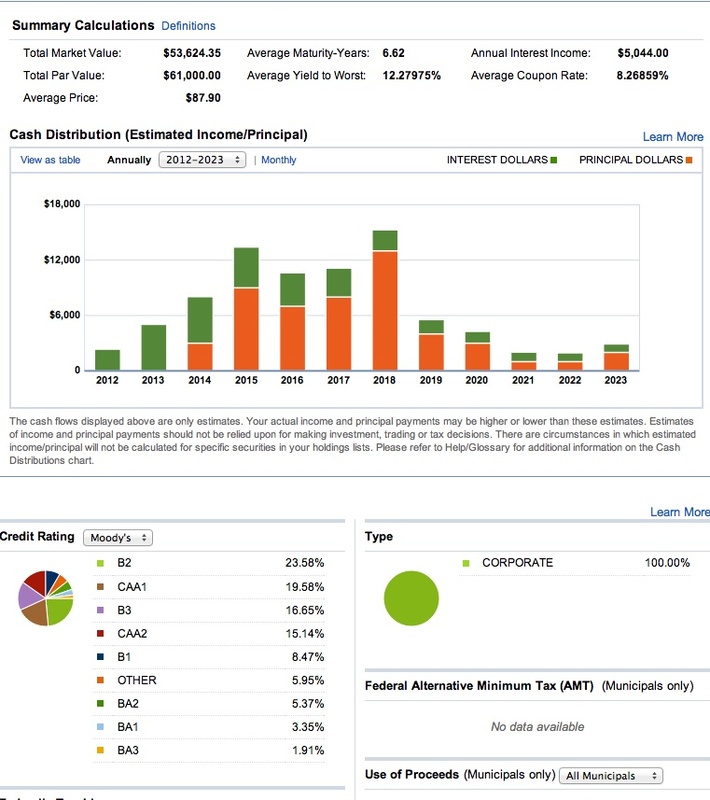 As of 6/30/12, the net interest margin was 3.74% (down from 3.68% in the year ago quarter); NPLs to total loans were high at 4.13% (though down from 6.15% in the 2011 2nd quarter); the coverage ratio was 59.65%; tangible book value per share was at $12.63 (net tangible at $14.03); tangible common equity to tangible assets was at 7.67%; the Tier 1 common capital to total risk weighted assets was 11.51%; and the return on average assets annualized during the quarter was .71%. First Interstate BancSystem Inc. Cl A rose 33 cents in trading yesterday to close at $13.87. 6. TRST (own: Regional Bank Basket Strategy): TrustCo reported second quarter net income of $9.1 million or $.097 per share, up from $7.8 million in the 2011 second quarter. The consensus estimate, made by two analysts, was for 10 cents per share. 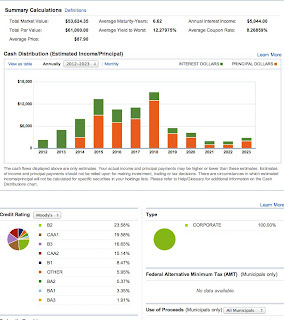 As of 6/30/12, the net interest margin was 3.19% (down from 3.42% in the 2011 2nd quarter); the efficiency ratio was at 52.24%; the NPLs to total loans stood at 2.01%; the coverage ratio was at 93.3%; tangible equity to tangible assets was 7.9%; and return on average assets for the quarter was at .83% (prefer over 1%). I have ceased reinvesting the TRST dividend. I am near break-even on my TRST shares. Trustco Bank fell one cent to close at $5.51 yesterday. Dole announced in its earnings release that it was considering the sale or spin-off of its packaged foods business. The shares rose $1.32 on the news to close at $10.1 last Friday, and I took that pop as an opportunity to sell my 30 shares. For the second quarter, the company reported GAAP income from continuing operations of $66 million or 74 cents per share. Dole Food fell 20 cents yesterday to close at $9.71. 8. Junk Bond Ladder Table (Junk Bond Ladder Basket Strategy): I will periodically post a table showing the income, appreciation potential and maturity schedules of bonds included in my very high risk junk bond ladder strategy. I have not included the three bonds currently in default. One of those, a senior AMR bond, has been rising in value over the past few weeks, narrowing my loss on that one bond position to around $300. The other two bonds in default are probably hopeless, the EK 2013 senior unsecured bonds. Of the ones not yet in default, I am most concerned about my Travelport (3), Edison Mission (1), Colt Defense (1) and AGY (1) bonds.